No more copying and pasting. Ever. We've added insanely fast email templates to Gmail! Templates allow you to automate your outbox and see how specific templates perform over time. These new features bring the emails you send most often just clicks away from compose. Adding a template means you'll never have to write the same email twice. Email Templates are easy to create, using the same formatting you're used to in Gmail. With Bananatag, you can create rich templates right from your compose window. What's also new for Gmail users is the ability to add intuitive variables (like First Name and Last Name) which can be used to personalize templates to each recipients. Using templates is fast. Routine emails which may have previously required copying and pasting or repeated formatting can now be personalized and sent in less than five seconds. Email attachments can also be saved to a template so you don't ever need to upload the same attachment multiple times for routine emails. With our new Attachment Tracking feature, engagement with your files will be tracked too. Email templates which have been saved can be inserted from the Compose window, and any variables created in a template are prompted to be completed once it is inserted into an email. This means that time is only spent on entering the information that you want to personalize. As long as a recipient is included before inserting your template, their first name (and last name) can automatically be pulled into a template from their contact information, without requiring any other action. 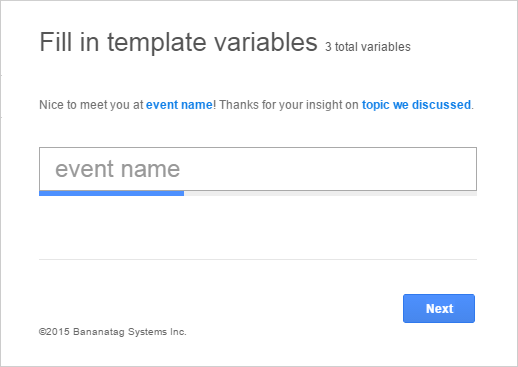 The email open and click data Bananatag users are accustomed to seeing for their emails through our analytics is also integrated right into the templates interface. After you send a template, its open rate and click rate will populate based on how your recipients interact with it. Over time this allows you to see which one of your templates is getting the best response. While your Bananatag account will keep track of all your data, this snippet of information in our Gmail interface makes it easier to make decisions about which templates to send without leaving your inbox. The folder structure within the templates interface is designed for sharing templates with your team. We've made it easy for sales teams using Bananatag to collaborate on their outbound email campaigns and see which templates are working best. Sharing templates among your team is a simple as assigning user permission to access folders in your account. 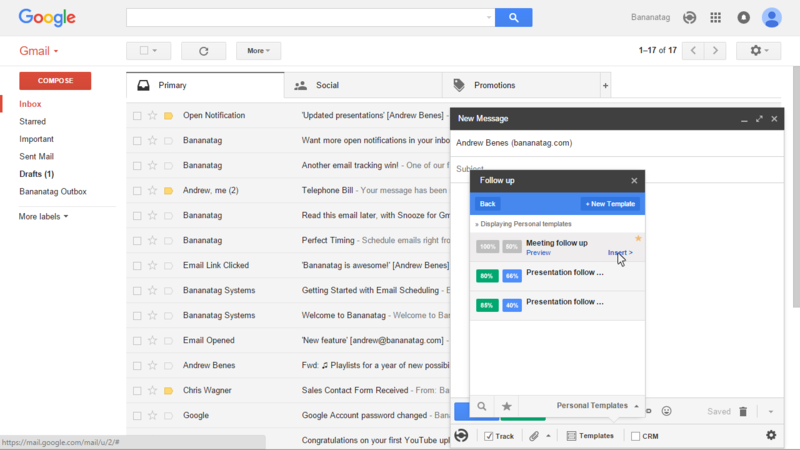 Get a download of the latest version of Bananatag for Gmail and start using templates for free! Your keyboard will thank us.